BlingLights manufactures its intakes from genuine ultra-light weight carbon fiber, Carbon Fiber Reusable Open Top Fabric Filter and comprehensive photo installation instructions. BlingLights Cold Air intake systems deliver the best looks, performance, value and ease of installation than any other cold air intake. BlingLights Cold Air intakes install easily under the hood. - BlingLights filters are completely shielded from drawing in warm air with the 360 degree attractive genuine carbon fiber heat shield. Built-in filter uses the newest open top design for increased air flow over conventional cone filters. - BlingLights filters dirt invisible to the human eye, and never needs filter oil! - Hi-flow flex pipe is rigid yet weighs less than that of any of the materials used by competitors. - Element is cleanable and is Made for Life! - Will not void your vehicle warranty! How Does It Work? When you bolt-on a BlingLights intake, you will notice the difference the next time you drive your vehicle. Our BlingLights Intake Kits are a great way and in many cases the only way to maximize airflow and engine performance. They will replace the factory air box providing both High-Flow air filter technology and a larger air filter size. This winning combination will increase horsepower and sound great too. 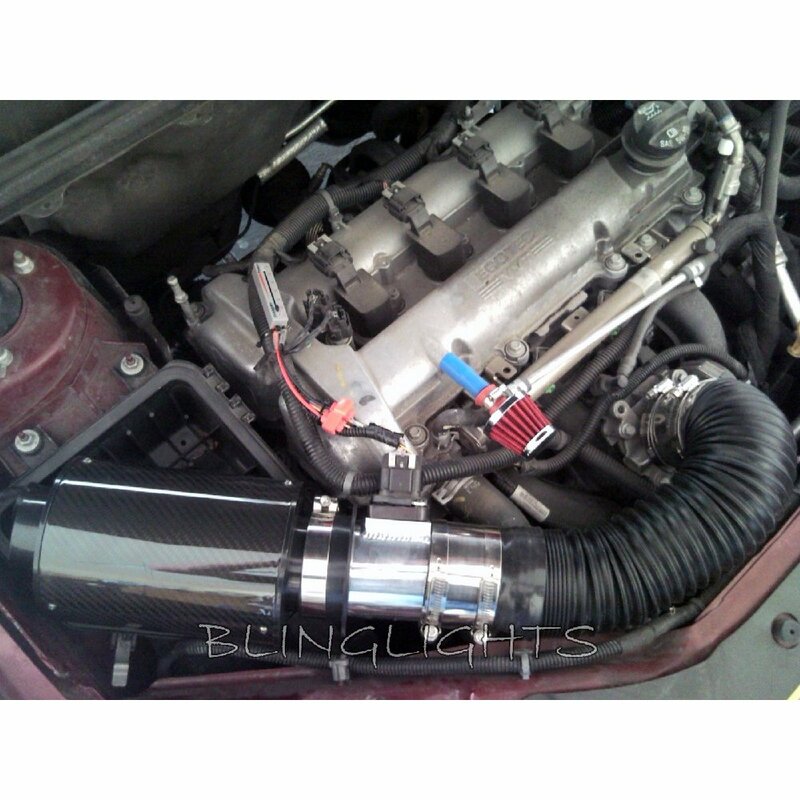 BlingLights Intake Kits are the correct diameter for each engine type and will free your car from the size restriction that comes with the factory air box. These economical kits can take a variety of different forms based on vehicle characteristics and available space under the hood. Each kit is designed to provide power throughout the RPM range. BlingLights intakes take advantage of the added airflow provided by an oversized air filter released from the restrictive factory air box. These kits bring engine airflow out of the factory box by providing a large size open-air conical High-Flow Air Filter. The extra surface area of these open-air air filters provide even more airflow at lower restriction than a name brand replacement filter which is always limited to the size of the factory air box. The larger air filter also captures and holds more dirt increasing its service life before a cleaning is required. The filter is then either directly attached to the engine carburetor or throttle body or indirectly through a tube assembly running from the filter to the engine. All adapters are made from high quality materials. Why Does the Factory Intake Need to be improved? Most people are aware that our High-Flow Air Filter can increase horsepower over a traditional disposable air filter. An air filter change alone however, cannot eliminate other types of air restriction built into the vehicle at the factory. These can be found in the size of the air box and the air path running from the air box to the engine. That’s where air intakes rule the road. They completely replace the factory airflow assembly including the filter, air box and air path. More and more people are discovering the monster power available from a well-engineered air intake, so go ahead and wake the sleeping giant in your car. How Do You Know It Works? We will not sell an air intake that does not provide a measured increase in horsepower and torque (acceleration). Our air intakes are proven to increase horsepower and torque on a wheel dynamometer (think treadmill for cars). These thoroughly engineered air intakes provide huge increases in power that a customer will definitely feel when they accelerate. Why Does BlingLights Make Such a Big Deal about Carbon Fiber? In addition to vehicle power, the overall weight of the vehicle is very important to overall acceleration. In general terms, a weight reduction of 100 pounds will lower the ET by .1 seconds. Carbon fiber, a black fabric weave held together by a transparent resin, weighs one-third to one-fifth as much as similar-strength steel but is seven to 10 times as expensive. Slicing weight dramatically improves fuel economy and performance, and is why carbon fiber is used in race cars and jet planes. The $65,800 Corvette Z06, uses carbon fiber in the front fenders, front wheelhouses and floor. Carbon fiber helps keep the weight of the 505-horsepower speedster down. BMW's M6 coupe, on sale in Europe, has an unpainted carbon-fiber roof. Not only does it save weight, it's beautiful to look at and has a high-tech feel. How much of an Increase in Miles per Gallon Should I see from using a BlingLights Intake? Results will vary depending on your vehicle, driving habits, load on the engine (towing for example), existing air system restriction, and other factors. Many BlingLights users report an increase in miles per gallon. Our internal testing is performed using employee and customer vehicles. We usually have the cars for a short period of time that will only allow for fit checks and dyno (power curve) testing. If you take advantage of added power by driving harder, you will not see much of a gain, if any, in MPG. Can I Install and Maintain the Intake Myself? The kit isn't complicated to install for most application, and the work can be done in your driveway with simple hand tools in about an hour. We recommend to have the kit installed at stereo shop if you are uncomfortable installing on your own. If you do it yourself, you will need a wrench, a ratchet, and a screwdriver. Every 50,000 miles clean the filter with filter cleaner found at your local auto shop. No need to ever replace the filter. Is the BlingLights Intake Street Legal? In most states our intakes are legal. Our intake kits may not be legal in states where under the hood modifications are not allowed. Check your local laws if you are unsure. Will the BlingLights Intake Cause My Vehicle Mass Air Sensor to Fail? No, it is both impossible and ridiculous. An engine can only take in a fixed volume of air depending on the engine’s size. The more restriction that an air intake system (filter, air box, and tubing) causes, the greater the potential is for power and mileage degradation. Will the BlingLights Intake Void the Factory Warranty? NO. The only time this can happen is from improper installation that causes damage to a vehicle system. If a service technician denies your warranty claim ONLY because the car is modified with an AEM intake system and the vehicle system failure was not a direct result of the installation and use of an BlingLights intake, please refer him to the Magnusson Moss Warranty act. You can download the Magnusson Moss Warranty act from SEMA’s website at: http://www.semasan.com/main/main.aspx?id=60128. What is the return policy? You are entitled to a full refund less shipping costs if item is mailed back within 60 days of receiving item. Item must be in the EXACT brand new condition it was received along with the order number and reason for return. Keep the hat just for trying our product even if you decide to return. This is the first performance product that I have purchased. I was very pleased with the increased power and torque, but I was most excited by the increased throttle response. Through research done prior to my purchase, I knew that I could expect about 15 hp in gains, and for $225, I felt it was a very reasonable purchase. I knew that this wasn't a supercharger, and I wasn't a two hour bolt on away from being a Corvette beater, but 15 hp is a great place to start. I am very satisfied.